Saloninus is the world’s greatest philosopher, and he offers his soul to the devil in exchange for money, the return of his youthful looks, and another 20 years of life. An unnamed demon is assigned to Saloninus to grant his terms but soon becomes suspicious of the philosopher’s deal and wonders if perhaps he was cheated. Readers will wonder the same and will be trying to piece together Saloninus’ plan and stay a step ahead, but the book is cleverly done and little is given away. Saloninus doesn’t act like any other human being the demon has dealt with before. The philosopher does things just for the demon and encourages friendship, or at least a truce: “What am I supposed to do, be nasty to you all the time? I haven’t got the energy.’’ And the demon isn’t typically evil (as has been suggested in other narratives and philosophies) but an art-lover and tea-drinker, always suspicious and cagey, and very intelligent yet somehow naive. Readers will feel a bit sorry for the demon—he’s only trying to do his job, while Saloninus appears busy trying to cheat him—after all, a deal is a deal, right? This is a Faustian tale except Saloninus doesn’t panic in the end nor look to God for forgiveness. Neither character is completely unique nor is the story’s premise. With some clever twists and turns along the way, readers will be wrapped up in author K. J. Parker’s web. 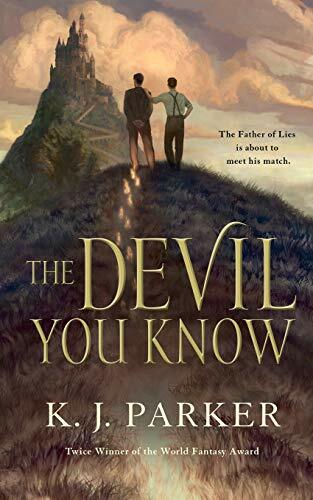 (K. J. Parker is a pseudonym for British author Tom Holt.) Readers who prefer more world building and a solid sense of surrounding won’t find it here; however, this is set in an alternate reality, but with real world counterparts as to situate readers and allow them to fill in gaps with their imaginations. It is the characters that drive the book, along with the dialogue, which is filled with witty one-liners and plenty of banter. The story is told from the perspective of the unnamed demon, a minor, harried functionary of the devil, and Saloninus in first-person point of view. The switches between viewpoints happen suddenly and without warning. The changes in point of view will confuse most readers who will have to retrace their steps to figure out who is talking. The blatantly misogynist views of both characters is offputting—women are tools to be used—and an afterthought. Though an easily expected viewpoint for a demon, to have a great philosopher also fail to consider the other half of humanity is sad but perhaps a social commentary (though this is doubtful since there’s barely enough acknowledged about women except as their use as a sexual release). Despite this issue, there isn’t repetitive woman bashing. And the protagonists do have enough depth otherwise to give readers a good tale. The narrative moves swiftly along through this novella, making this a fantastic read for a slow afternoon or a short flight. Fans of Terry Pratchett and Neil Gaiman’s Good Omens will enjoy Parker’s style.